As of October 2018, information about the Healthy Weston programme is now located on the Healthier Together website. Visit www.bnssghealthiertogether.org.uk/healthyweston for the latest news and information about the public consultation. Healthy Weston is a programme to join up services for better care in Weston-super-Mare, Worle and surrounding areas. This includes the future for services at Weston General Hospital. and spent nearly five months listening to the views of and working with many local people, patients, staff and other stakeholders to test and refine the ideas set out in the vision to improve health and care services. We had an exceptional response from the local community: more than 1,300 people completed our Healthy Weston online survey and we held 46 meetings and workshops across the local area with local people, staff and other stakeholders taking part. Thank you to everyone who took the time to give their views. A report produced by The Evidence Centre can be viewed below, providing an independent summary of all of the feedback we’ve received. The Healthy Weston programme is still ongoing and you can find out about the latest updates and opportunities to get involved by visiting the Healthier Together website. Our proposals for changing local healthcare services, including the services at Weston Hospital. 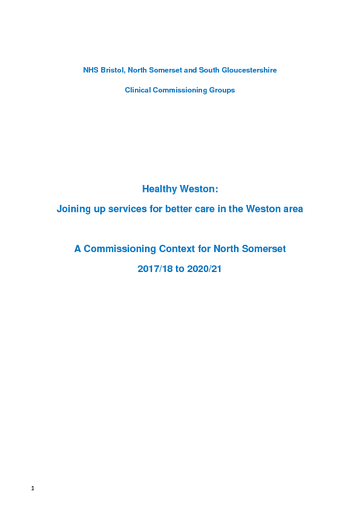 An independent summary report by The Evidence Centre of feedback the CCG has received through the Healthy Weston project. 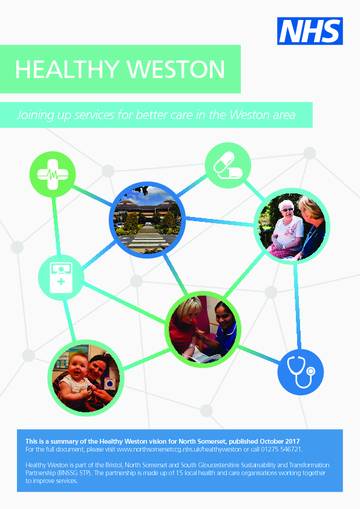 Download the full Healthy Weston vision, setting out our ideas in more detail for organising and delivering local health and care services. 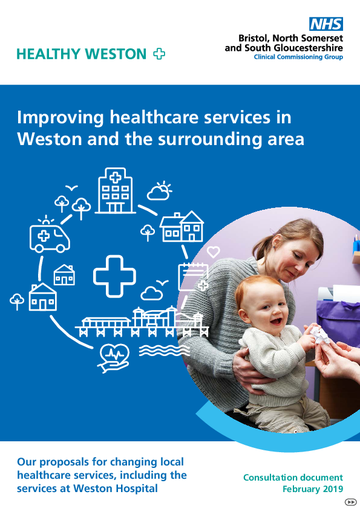 Download our summary document which outlines our vision for joining up services for better care in the Weston area. 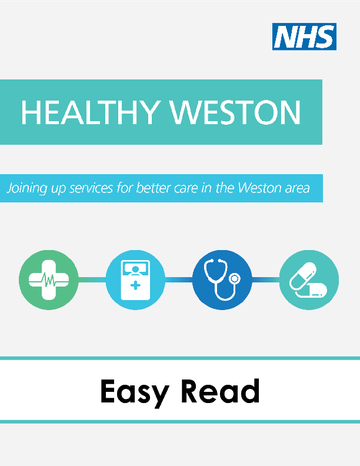 Download an easy read guide to health and care services in the Weston area. Dummy field A field for consultations which do not have on-site forms.